NSFA, Panacan, Davao City - Sixteen Fire Arms and two International Humanitarian Law banned landmines were captured by the government troops after successive encounters transpired when Community information led the pursuing troops to track the fleeing members of the CPP-NPA Terrorist Group (CNTG) in Bukidnon Province and in nearby Arakan Municipality of Arakan from April 7 to 11, 2019. Lately on April 12 , 2019 a platoon of 3rd Infantry Battalion (3IB) under Ltc Oscar Partuza while conducting clearing in the vicinity of Sitio Pulang Lupa, Brgy Sinuda, Kitaotao, Bukidnon, captured three M16 rifles believed to be left by the fleeing CNTGs encountered earlier. 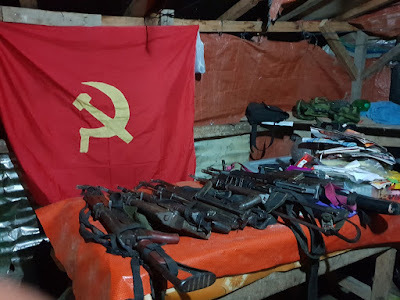 It can be recalled that the troops of same unit encountered in two instances an undetermined number of CPP-NPA Terrorist Group (CNTG) in the hinterland of Sitio Ngaran, Barangay Kipilas, Kitaotao, Bukidnon in the morning of April 7, 2019. The CNTG left one NPA killed; one AK47 rifle; one M653 rifle; one M16 rifle; 3 cal 45 pistols; one International Humanitarian Law banned landmine; one combat pack; personal belongings and subversive documents after they scampered to a different direction. Community information led to another encounter on April 9, 2019, by the same Battalion with the CNTG believed to be the same group in the periphery of Purok 11, Sitio Pulang Lupa, Barangay Sinuda, Kitaotao, Bukidnon in the morning and afternoon of April 9, 2019. The firefight resulted in the capture of five AK47 rifles, one International Humanitarian Law-banned improvised landmine and landmine paraphernalia, two grenades, seven cellphones, five backpacks, and subversive documents. There was no reported casualty on the engaging troops while undetermined on the side on the CNTG. Pursuing troops were able to track the fleeing CNTG and again engaged them in an encounter in Sitio Ngaran, Barangay Kipilas, Kitaotao, Bukidnon in the morning of April 10, 2019. The fleeing troop left two AK 47 rifle and AK 47 ammunition. On a separate occasion, the troops from the 88th Infantry Battalion encountered another group of CPP-NPA Terrorist at Sta. Felomina, Quezon, Bukidnon, noon of April 9, 2019. The 15-minute firefight caused the life of one soldier identified as Pfc Jonathan Solis. In the periphery of Barangay Balete, Arakan, North Cotabato troops from 901st Infantry Brigade engaged in a brief encounter undetermined number of CNTG after the troops responded to the information of armed men thereat in the morning of April 12, 2019. No reported casualty on bothsides after the brief encounter. Since April 1, 2019 there are 19 community information led encounters against CNTG transpired in the whole area of Easmincom that led to the recovery of 21 Firearms and seven IHL banned landmine. Further, three CNTG members were reported killed while two surrendered after a fierce fight. Lt. Gen. Santos Jr. express appreciation on the cooperation of the communities and vows to use the might of the military to stop the CNTGs from their evil activities against the communities. We again express our appreciation to the cooperation of the communities as they help the security force by reducing the maneuver space of the terrorist. To those who continue to disregard the call of the communities of a peaceful environment, we will use the full might of the military to go after them without disregarding the International Humanitarian Law and Human Rights," Lt. Gen. Santos said.